Present state: The goods station has now been partially demolished to make way for the East London Line extension which now incorporates a new Shoreditch High Street station on the site. Notes: An Act of Parliament passed in 1836 authorised the building of the Eastern Counties Railway between London and Great Yarmouth. The London section of the Eastern Counties Railway opened in June 1839 from a temporary terminus at Mile End to a temporary station at Romford. The following summer the line was extend to a permanent terminus at Shoreditch. The line was also extended into East Anglia, reaching Colchester in March 1843. 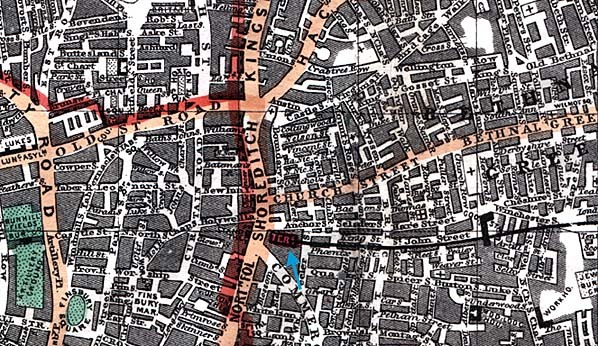 Shoreditch Station was renamed Bishopsgate on 27th July 1846. Broad Street Station facing on to Liverpool Street. 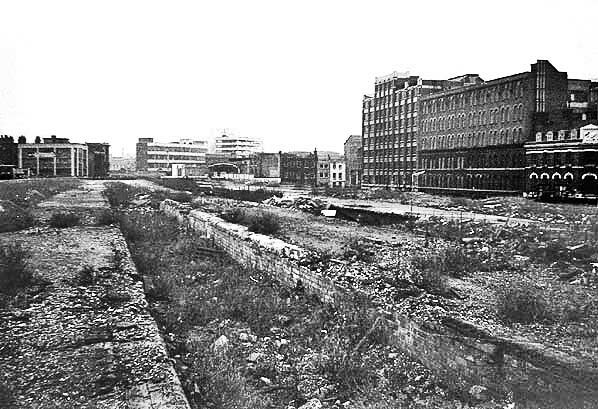 In order to reach the new terminus a new line diverged on the north side of the viaduct into Bishopsgate curving round under Bishopsgate and into the new terminus at Liverpool Street. To accommodate Bishopsgate's passengers, new low level platforms were constructed at Bishopsgate, one underneath the existing station and the other on the south side of the old terminus. 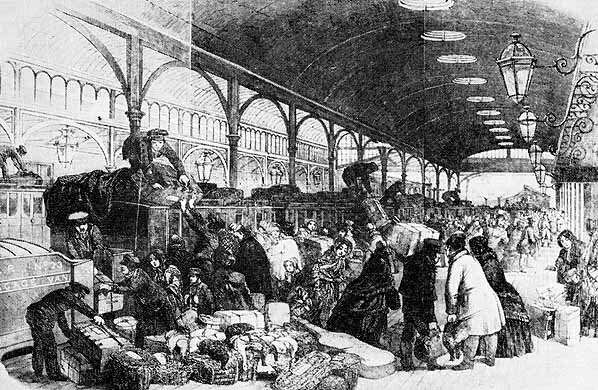 Following the opening of Liverpool Street, Bishopsgate Station was closed on 1st November 1875 although some trains still used the station until 1879. 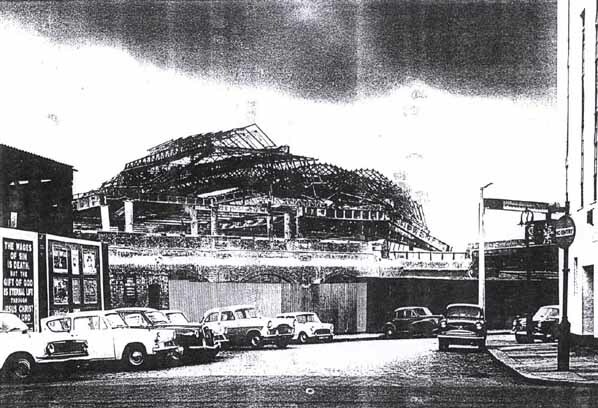 Bishopsgate was rebuilt as a two level goods station remaining in use until destroyed by fire on 5th December 1964. The goods station has now been partially demolished to make way for the East London Line extension (now London Overground) which now incorporate a new Shoreditch High Street station on the site. 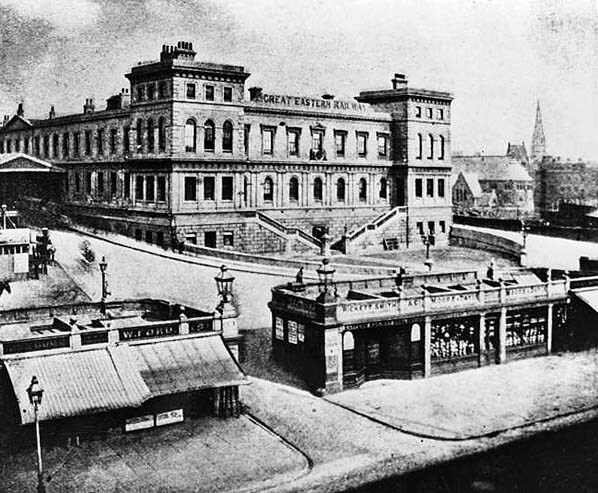 Bishopsgate station in 1863. This station was replaced by a new station at Liverpool street in 1875. Bishopsgate station then became a goods depot. Reproduced under Creative Commons Licence © National Railway Museum and SSP. Reynolds Map of Modern London 1859. 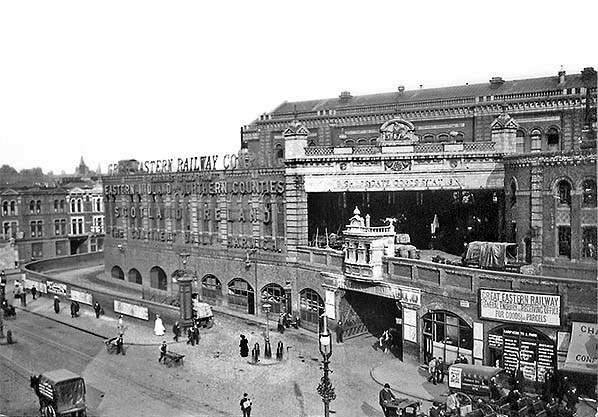 Bishopsgate goods station in the first decade of the 20th century.